JUST WANTED TO WISH YOU A HAPPY HALLOWEEN! This is for my Grandson. 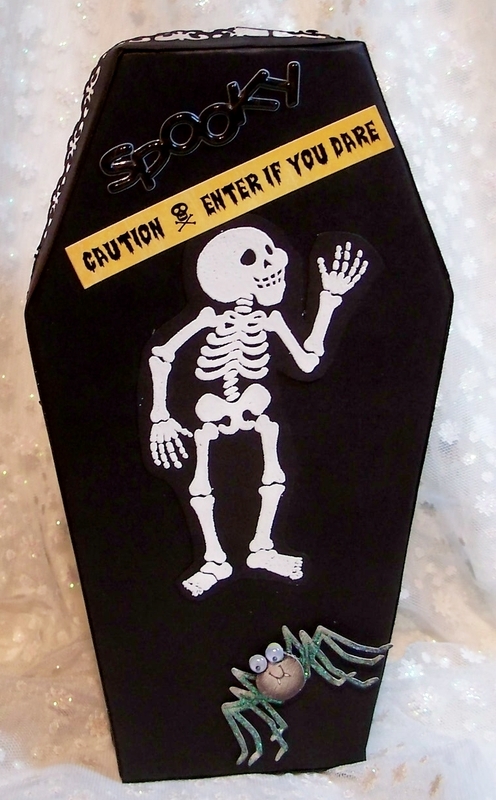 I bought the paper mache coffin at Michael's. I covered the lid with black paper and painted the bottom black. Stamped skeleton on top and added some stickers and fun embellishments. I slipped an itunes card into the middle of some candy inside. This bag is for my Granddaughter. The bat is cut from sparkly black glitter paper. Bought the bags at Big Lots...cheap. 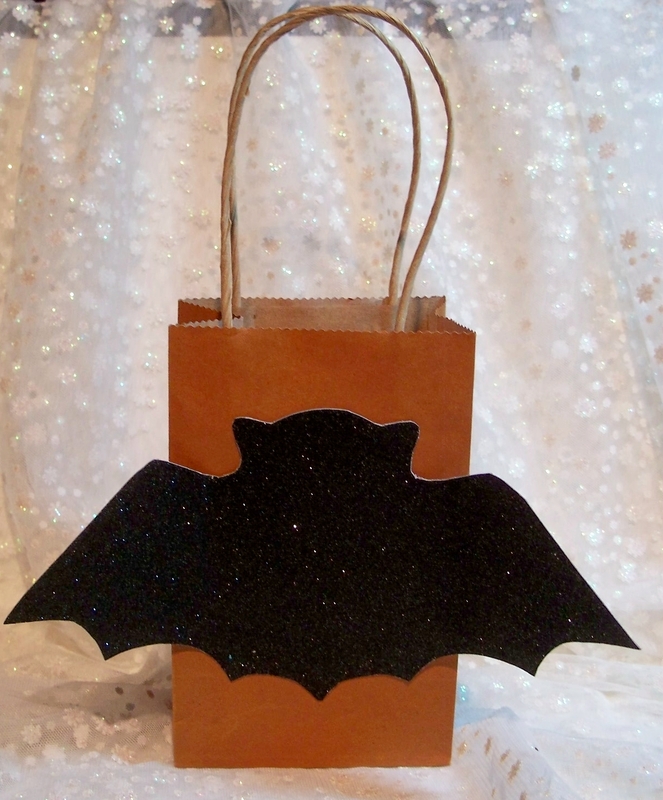 Inside is a matching box decorated with a bat border by K & Co. I also slipped an itunes card in the box with her fav candy, peppermint patties. Have a safe Halloween, happy trick or treating. 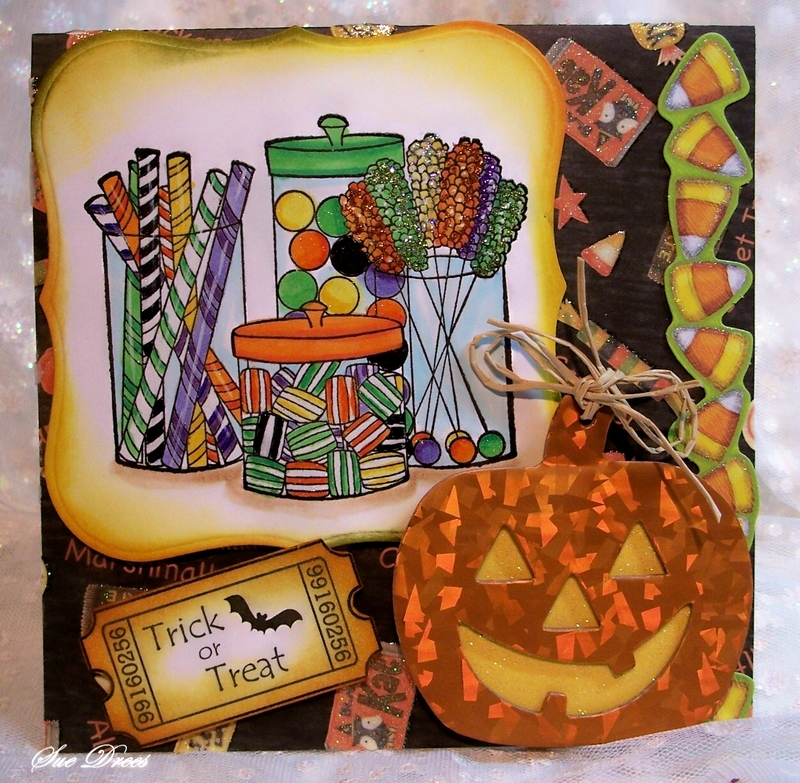 ohh such a fun Halloween card. and all other projects are very spooky cute. What a fun card! I love all the details! Great projects too. 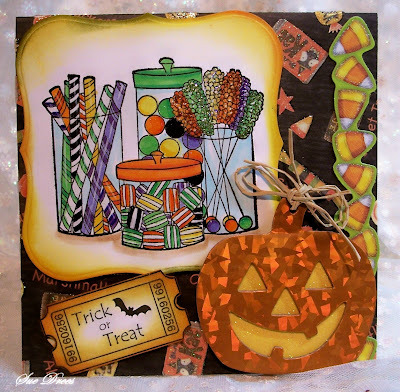 Totally fun projects Sue! Yes, I seem to run out of time for the last part of the year holidays! I bet your Grands loved their presents! Sue, Sorry I didn't get to too many blog yesterday. The day just got away from me. Your grandchildren must be the happiest on the block. Both of these ideas were great, but I have to say, that coffin is really something else. The different papers, embellishments, just everything about it. Wonderful job on both. You gave me some ideas for next year, thanks.